I'm going to be captain obvious here when I say that raising small kids on a sailboat takes a bit more effort than on land. It's not necessarily 'harder' (different, yes) but it does take a little more forethought, planning and innovation. 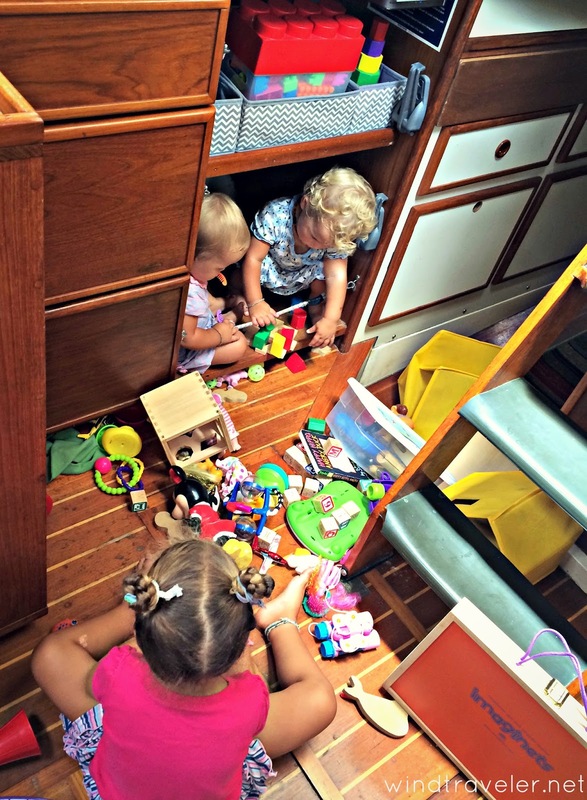 Storage, particularly toy storage, is one amenity most boats lack. We don't have basements, closets or toy rooms which means we boat parents need to be very thoughtful about what sort of toys will give us the most "bang for our buck" while simultaneously taking up very little space. While I am very much of the "less is more" mindset for children's toys (our girls have more fun playing with pots and pans than almost anything! ), I don't want to deprive our girls of toys completely and I put a lot of thought and research into exactly what toys I brought aboard. After five months of use, these ten really shine as fantastic toys that not only stimulate creative play and hold up to toddler (and baby) abuse, but take up little room and store very easily. Most of our toys are kept in their own sub "bins" and we bring out one "bin" at a time to keep the toy mayhem (read: mess) at a minimum and stay organized. Safari Ltd Miniature TOOB Sets - These are my favorite. We have about five different tubes of these and store them all in a small bin. The animals are small, so probably not great for babies (though we let our babies play with them), but they have entertained our girls for hours. Thanks to these toys, Isla can now easily identify various reef fish and even an armadillo. 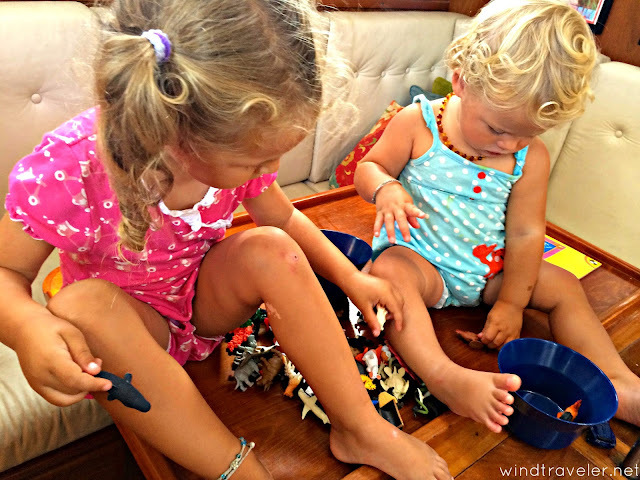 Great learning tools and great for independent play. 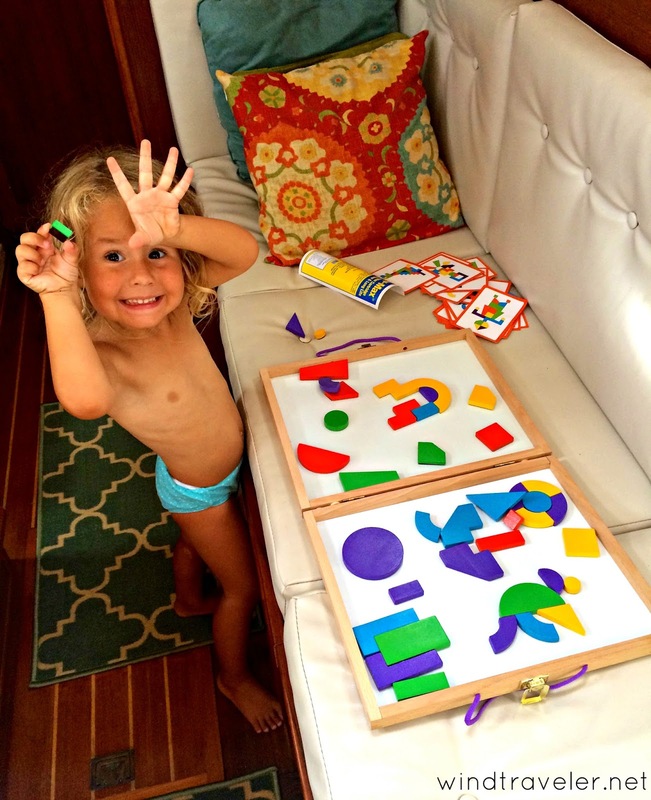 Melissa & Doug Water Wow Paint Kit - markers are messy and Isla has never been a fan of crayons. These Water Wows are amazing. They each have five pages (or 'scenes') and come with a pen that you fill with water. Once the water touches the pages, the color shows up. Once it's dry, it's good to go again, and again, and again. Great for taking out to restaurants or road trips where crayons and markers aren't always the best option. We're actually fans of pretty much all Melissa & Doug Toys for our girls. 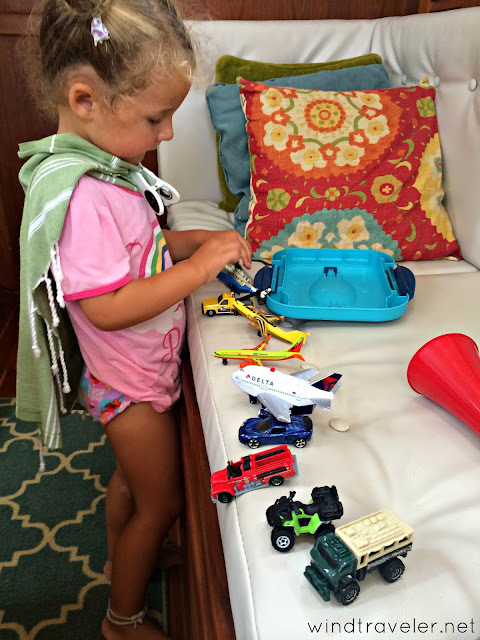 Matchbox Cars and Airplanes - Like the zoob tube animals, these are small and fun. We have about twenty of them that stay in their own special bin and the girls love to dump them out and play. They "drive" the cars and "fly" the planes all over the boat. Large Lego Set - we were gifted a cheap set of Duplo-style legos that have their own container. Again, a simple toy that promotes thinking skills and creativity. Seriously cannot go wrong with legos in my opinion. Hours of fun. Looking forward to when the girls are older and we can get some more complex sets! Magna-Tiles - another winner in my book. These are different shaped tiles with magnets built in that you can connect together and build with. I hemmed and hawed on whether or not to get these because they are not cheap, but in the end, I did and I'm so glad for it. With a tag line like "where math, science, and creativity meet" I figured they'd be worth it. They're a little too complex for the babies (though they love to make them "stick" together) but Isla loves to build complex structures and "homes" for her mini animals (see #1). 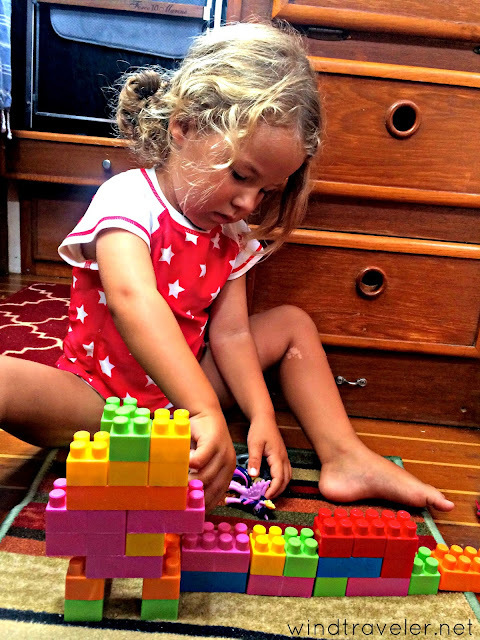 She'll sit and entertain herself for up to an hour with these tiles and we love to build different structures with her. What's best? They store practically flat in their own bin. I Can Read! Paperback Book Box Sets - there is no such thing as too many books in my opinion. As an avid reader and lover of books, I want to instill the same love of the written word in my children.We have a bunch of these box sets which are great, as well as The 20th-Century Children's Book Treasury: Picture Books and Stories to Read Aloud which has about fifty books in one. We prefer paperback to hardcover because they are much easier to store and lighter to carry. Our girls love their books and it's not unusual for all three girls to sit and "read" for long chunks of time together (even though none of them can actually 'read' yet). We also love all books by Julia Donaldson , Kevin Henkes , and the Berenstain Bears series. Preschool Color & Activity Books - These toddler "work books" by Roger Priddy are great. Super colorful, fun, and full of stickers - what toddler wouldn't love them? When the twins are napping, Isla and I will sit together for an hour or so coloring pages, working on puzzles and putting stickers in the right places to fill out scenes. It's a great brain boosting - and bonding - activity for us. We have several on board and they provide lots of opportunity to learn. Beach Sand Toys - our girls go to the beach at least once a day (sometimes twice) and while they really can entertain themselves pretty well with the sand, surf and swimming, having some shovels, pails and cups to play with is fun. Our friends on s/v Necesse have a little plastic tea set and the girls love to make "tea" and "cupcakes" at the beach and serve it to us mama's. We keep these toys on our aft deck in a mesh beach bag so that we bring minimal sand on the boat. I suggest not spending too much on these because they don't last long with the combination of daily use and harsh UV rays. Musical Instruments Set - What child doesn't love making a good, loud ruckus?! Our girls love their "band in a box" and it's frequently the toy they are reaching for when digging through their play area. We've added a few more instruments (an egg shaker, some more maracas...etc) and they love to make "music". Don't go calling us the "Partridge Family" just yet, but we have high hopes. 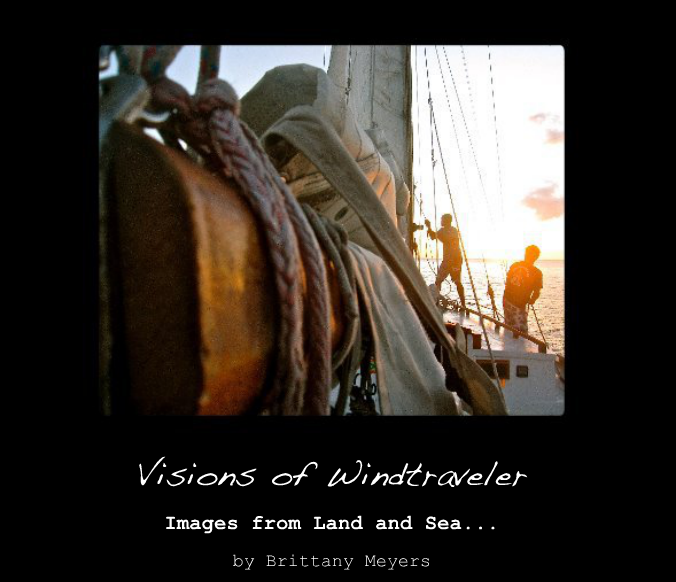 iPad - I'm loathe to admit it, but we really love the iPad on our boat and, let's face it, whether we like it or not it's the world we live in today (did you know they give iPad's to high schoolers now where all their classwork is?!) 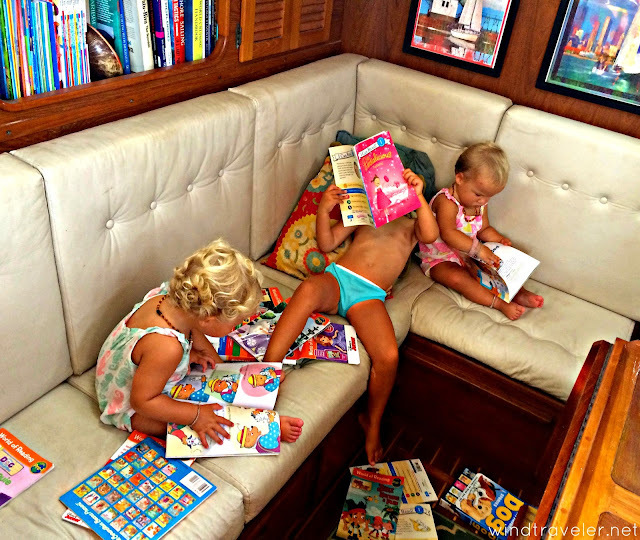 It's a special treat and not something Isla plays with every day, but there really are some great educational toddler apps that keep Isla happily playing (and learning) when we are having "quiet time" on the boat or if the boat needs both mine and Scott's attention. We use this protective toddler case and a few of our favorite educational apps are: Tozzle (great puzzles that entertain and teach), Endless ABC/Endless Reader (teaches letters, definitions of new words and spelling in a super fun way), Tangrams (mind puzzles where kids make interesting patterns out of simple shapes) and Phonics Farm (many games to help learn kids identify words, sounds and develop skills for early reading). 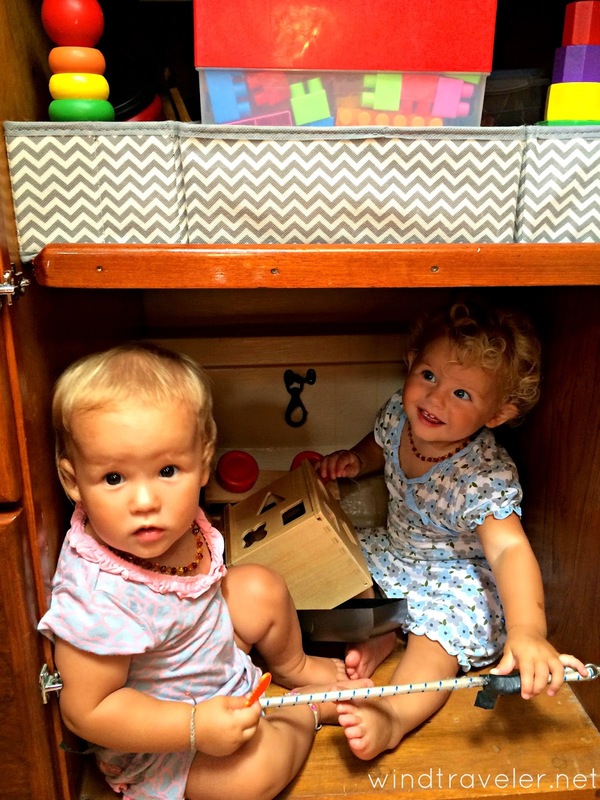 Of course we also have a hefty craft cabinet and our girls love to play "dress up" and "kitchen" with whatever is lying around on the boat. But these ten toys have earned their space on our boat. What are you favorite toys and apps for kids in small spaces? We're always interested in learning more! Share in the comments. What parent can't sing praise about legos? They are great. Cars and planes are two of her favorite things. This is where 98% of their toys are kept. Not that big of a space! This is our "imgaginets" game, not on the list - but similar to the magna tiles. Lots of fun. Water wows have provided us with HOURS of entertainment. We travel across the country in our sprinter van about 6 months out of the year and have found many of these on our "go to" list! 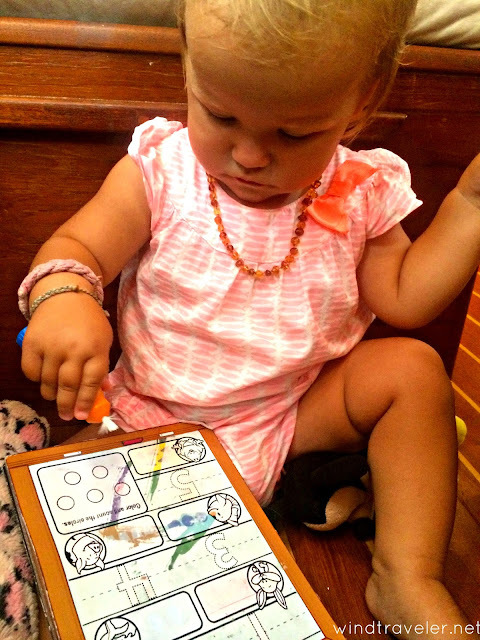 They pack nicely, are easy to stow and provide hours of learning and FUN! 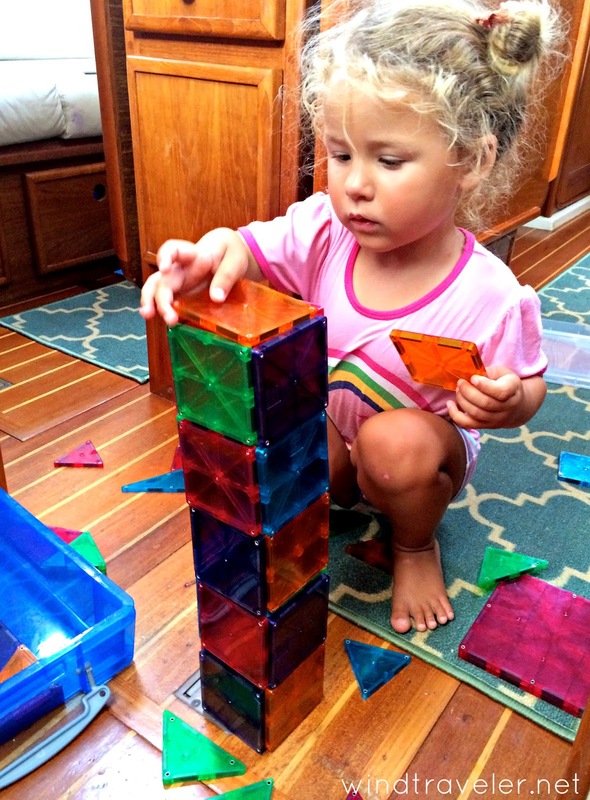 Our *most* favorite at the moment are the Magna tiles! I just learned of one or two more for your list that seem like they will fit nicely in our rotation! We have the two boys (now 2.5 and 3) 6 dogs and the two of us so toys/entertainment that take up as little space as possible but provide brain and entertainment stimulation are always winners!!!! Thanks for the iPad suggestions... We haven't gone there yet but feel we may need to have them learn some of these educational games soon! Still hopeful that our paths will cross one of these days to meet you and reunite with Scott...in Utah, or perhaps on our cross-country travels! 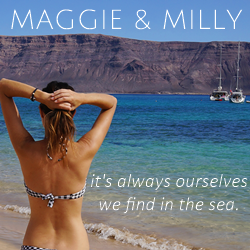 Thanks for tremendously enjoyable writing and fabulous blog! Much love to you, Scott and the adorable tiny people! Love this list! 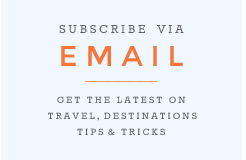 We have quite a few car trips and these sound great for travel. On a whim, we picked up some miniature construction equipment toys which it proved to be a huge hit, so I'm really intrigued by these TOOB toys! Awesome place! Best Toy Review Experts site where you get the best toy for your child and good selection and nicely setup all things in the site….It has a great selection of wooden toys for infants, and as the kid grows up, the toys just get more interesting., It's actually fun to look at everything they have there and hard to narrow down what to buy.